Color Your Own Shabbat And Havdalah Puzzles. This 2 Sided Puzzle Comes With 4 Crayons So You Can Be Creative And Color Each Piece In! 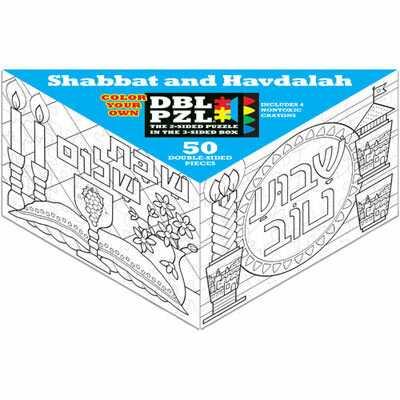 This 50 Pieces Puzzle Has A Different Image On Each Side To Create Two Different Shabbat And Havdalah Puzzle Designs. Contains 50 Pieces To Create An 11" X 15" Puzzle. Comes Packaged In A Triangle Shaped Box Depicting Images Of Both Puzzles.